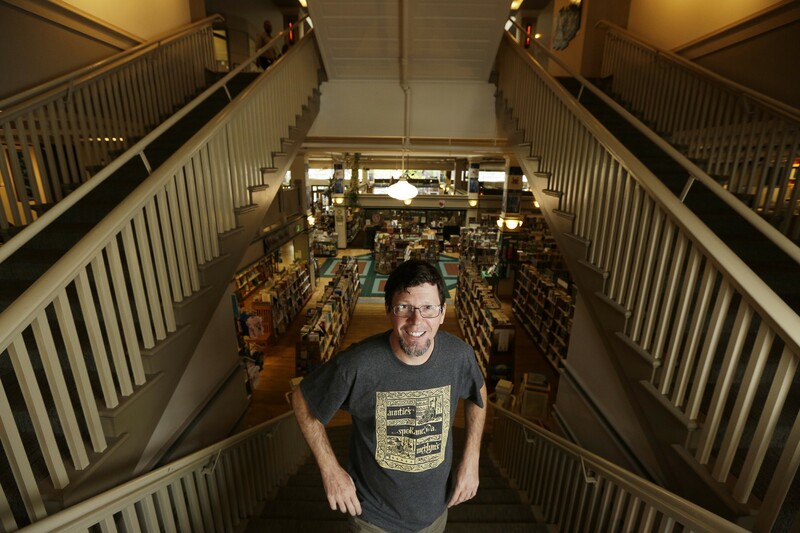 Auntie's owner John Waite purchased the iconic, independent bookstore in 2016. John Waite isn't worried about Amazon. Or at least he's not worried about any real or imagined impact that the e-commerce giant's physical presence will have on his businesses. Waite owns Auntie's Bookstore and Merlyn's Comics and Games, two brick-and-mortar shops downtown. "I don't worry about the fulfillment center any more than I do about Amazon in general," Waite says of the 2.5 million-square-foot warehouse to be built southwest of town near the Spokane airport. The same goes for Andy Dinnison, owner of Atticus Coffee and Gifts and Boo Radley's gift shop, both located near Riverfront Park. And make that three for Nathan Huston, owner and sole employee of Giant Nerd Books, a den of esoteric, quirky and collectable reading material just north of the Spokane River on Monroe Street. As larger chain retailers are feeling Amazon's heat — Toys "R" Us and Radio Shack filed for bankruptcy in the past two years; Borders bookselling national chain has been gone since 2011 and Barnes & Noble is flailing — these local independents have nestled comfortably into a niche at a time when local bookstores across the country are making a resurgence. Between 1995 and 2000, the number of independent bookstores fell by 43 percent, according to the American Booksellers Association, a nonprofit dedicated to promoting indie booksellers. But from 2009 to 2015, independent bookstores grew by 35 percent, the ABA reports, from 1,651 stores to 2,227. "... This has been an especially fascinating industry to study because indie booksellers provide us with a story of hope." For Dinnison, Waite and Huston, it's about creating a shopping experience, zagging where Amazon has zigged. "I'm not trying to compete with them on basic widgets that I know they can buy for less than my cost," Dinnison says. "I think as a small, local independent, you have some ability to pick and choose and move away from stuff when you realize Amazon is selling it at a lower price." For example, he points to the Great PNW clothing line or the art prints by local artist (and former Inlander art director) Chris Bovey. He knows not to play the bestseller game. Amazon's got him beat there, but he tries to stock some odd or off-the-wall stuff "like the silly fart joke books that they just need because they're laughing at it and it's an impulse purchase." Part of Auntie's success, Waite says, is due to the in-store events, and by extension, the sense of community you can't get by shopping online. Take, for example, the authors the bookstore brings to town: bestsellers David Sedaris, Marie Lu and Louise Penny, as well as regional authors Bruce Holbert and Paul Lindholdt. Customers are able to buy some items off Auntie's website, but Waite doesn't sell any Meryln's merchandise online. "I understand it, some businesses do, but I think you're contributing to your own death by doing that," Waite says of opening an online store. "But each entity has to make its own decisions why or why not." That's where Huston differs. He's taken more of a if-you-can't-beat-'em-join-'em approach. Now, Giant Nerd Books is filled with the intoxicating, musty smell of old paperbacks, but the shop actually first started as a third-party seller on Amazon. Huston opened the physical space about five years ago, he says. "I wish I didn't have to sell online, but these are the times in which we find ourselves," he says. Initially, his business was split about 80/20 in favor of online sales versus sales in the store. Now, he says, that balance has shifted to about 60/40 in favor of in-store purchases. "As I got a better handle on what people want to buy locally, I put less online," he says, adding that he does occasionally buy items for his shop off Amazon, and if the new fulfillment center means he'll get those items quicker, well, maybe there's a silver lining, he says. A Harvard business professor is studying how and why these booksellers have escaped the "Amazon effect." All three local retailers fit into the three factors professor Ryan Raffaelli identified as key to independent booksellers' success: community, curation and convening. "The theoretical and managerial lessons we can learn from independent bookstores have implications for a wide array of traditional brick-and-mortar businesses facing technological change," Raffaelli tells Working Knowledge, Harvard Business School's news website. "But this has been an especially fascinating industry to study because indie booksellers provide us with a story of hope." One concern all three Spokane business owners share, though, is whether Amazon will pay its fair share — with its new Spokane employees and with their taxes. The original print version of this article was headlined "Brick or Click"